Good Fats vs. Bad Fats - how to tell what's what and still lose body fat! The good fats are first and foremost unrefined. This means that they have not been heated, over processed or created out of chemicals. These are the fats that are found naturally in plants and fish, not in processed foods, the foods that come in boxes or packages. There are healthy fats in animal foods but often we eat far more than we need and that can lead to illnesses like heart disease, high LDL cholesterol, and high triglycerides. These "good for you" fats are definitely not in food that has been dehydrated, made into powder or chemically treated to look like fake butter! These are the fats that are called hydrogenated or trans fats and they appear in all sorts of processed foods. You have to read the labels on boxes of food carefully. Transfats can have a very negative effect on your health and have been linked to high cholesterol, hypertension, allergies, cancer, obesity, diabetes and immune disorders. There is a vast amount of conflicting information about fats in the diet and it can be difficult to sort out. The fact is we need fats for good nutrition. Many fats provide essential fatty acids that are just that...essential for our bodies to function properly. It comes down to eating the right fats that have been prepared properly in the right amounts. The quality fats that we should eat the most of are unsaturated which just means that the fats are liquid at room temperature. They can be polyunsaturated or monounsaturated. As far as how much of them to eat, just 25 - 30% of your diet can include fats and most of these should be the unsaturated fats. These are found in plants and fish. The healthy fats are the oils that are cold pressed and unrefined. This means they are not cooked or chemically altered. They smell and have the color of the fruit or seed or nut they came from. If you can find hemp butter in a natural foods market it is nutrient rich and one of the best sources of essential fatty acids. It is not for cooking but it can be used as a spread. The saturated fats are solid at room temperature and they are the fats in animal foods like meats, eggs and in dairy products. Coconut is an exception because it is a plant that has saturated fat. Coconut oil contains medium chain fatty acids which sets it apart from other saturated fats. Be sure to buy organic, virgin coconut oil. It is exceptionally nutritious. Cultures where coconut is a mainstay in the diet do not have heart disease. We need just a little of the saturated fats, 10% of your total calories. These fats are only "bad" when we eat too many of them. Then they can raise your triglycerides, your LDL cholesterol (the bad cholesterol) and increase your risk for heart disease. If you cook with unrefined, virgin coconut oil and olive oils and minimize the animal fats in your diet you will not be getting too many saturated fats. In order for the fats in your meats to be "good for you" fats you must buy grass fed beef, organic pork and organic lamb and chicken. If they are fed high glycemic corn based feeds and vaccinated with antibiotics and hormones they will not be healthy foods. Eggs from free range chickens that are fed organic feeds will have essential fatty acids which makes them an excellent source of good fats. Scientists now know you cannot lose weight by eliminating dietary fats. 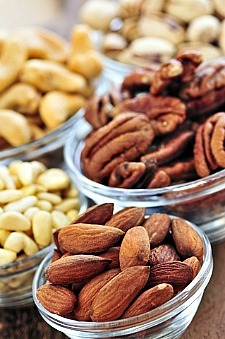 In fact, they have established that good fats are needed to regulate blood sugar and digestion. They help to prevent diabetes and insulin resistance. Fats are essential to assimilate most vitamins and minerals (the fat soluble ones) and they are an energy source. It's important to eat good fats in the right amounts. What you need to eliminate from your diet is sugar! Sugar causes inflammation and when you combine sugar with fat that is when you get fat storage. Nuts and seeds are wonderful sources of good fats but you need to limit how much you eat because of their high fat content. That means one serving at a time and seven nuts make up a serving. You can chop walnuts or pecans or your favorite nut and sprinkle them on your oatmeal, your yogurt or on a salad. Think of your fats as the trimming on the tree or the icing on the cake; they are not the main event. The main event are the vegetables and fruits that take up half your plate. One quarter of the plate will be whole grains and the other protein that contain good fats. These are what add so much flavor to what you're eating but too many make you ill, especially the saturated fats. Good fats raise your metabolism and help you burn your body fat. All fats, whether they are the saturated fats in meats or the unsaturated fats in plants, all oils, butters and even mayonnaise are low glycemic. They slow down digestion and make us feel fuller longer. It's best to get most of your good fats in protein foods and use just very small amounts of oils to flavor vegetables and salads. The good fats are essential for our health and well being. Flaxseed oil is the highest in essential fatty acids and hemp butter is high as well. The most nutritious raw nut is the walnut. The best source of EFAs in fish is salmon. Virgin coconut oil may be the most nutritious of the saturated fats but it must be of good quality. Flaxseed oil is very fragile and must be refrigerated and is too expensive for most people to eat as a salad dressing. However, you can buy flaxseed meal and sprinkle it on your cereal for added nutritional benefit. Flaxseed oil can be used therapeutically. Most people eating the typical American diet are seriously deficient in some of the omega 3 fatty acids that are in plant fats. This is a real problem for your health because they prevent obesity, minimize circulatory disorders, help prevent cancer, heart disease, arthritis, immune deficiency diseases, kidney disease, depression, ulcerative colitis, asthma, hives, psoriasis, enlarged prostate and migraines. Commercial oil processing is a very nasty business. Good fats are always the least processed. The only oils not treated to harmful processing methods that renders them nutrient deficient and often damaging, are virgin olive oils and some unrefined oils. Udo's oils (available in natural foods stores) were the result of a pioneering technology that protects them from light and heat. They are balanced for EFAs and are of excellent quality although they are meant to be used therapeutically rather than for cooking. Virgin olive oil is the highest in monounsaturated fats which protects against cardiovascular disease and supports healthy brain function. Olive oil is an essential part of the Mediterranean diet. In these cultures there is a low incidence of heart disease and cancer. You would do well to use virgin olive oil, organic, virgin coconut oil or real butter for your cooking. For salad dressings virgin olive oil is best. Read the labels carefully. Is the olive oil packaged in dark colored bottles, brown, black or green? Is it a green color and smell like olives? Is the coconut oil virgin organic? It should have the fragrant smell of fresh coconut. All oils contain all three types of fats (saturated, monounsaturated and polyunsaturated fat) but in varying percentages. More delicate plant oils, omega 3 oils like flaxseed oil and hemp seed oil do not stand up well to heat and should never be used for cooking. In earlier times there was no attempt to extract the fats from seeds because it was too expensive and the oils made were too fragile. When they are mashed and cooked at high temperatures the nutrients are destroyed. Sometimes chemicals solvents are added to increase oil yield after pressing. Even though the solvents are then evaporated traces can remain in the oil. So there are many poor quality polyunsaturated, vegetable oils on the market because they are too refined and over processed. As polyunsaturated oils oxidize and become rancid they create free radicals in the body and hasten aging and weaken the immune system. Then there's the hydrogenation process which is intended to provide cheap, plastic spreadable fats that can take the place of butter. Because there were concerns that people were eating too much saturated fat these margarines and other unhealthy products were intended to be healthier substitutes. With hydrogenation, oils are placed under pressure with hydrogen gas in the presence of a metal catalyst, nickel and aluminum. So hydrogenated or partially hydrogenated products can contain aluminum which has been associated with cancer, Alzheimer's disease and osteoporosis. Avoid the so called "artificial fats" like Olestra, Salatrim or other fake fats in the "fat free" cookies, chocolate chips and other food products coming on the market. Avoid margarines, partially hydrogenated vetable oil, shortening, processed, refined vegetable oils like canola, corn, soybean, cottonseed, safflower, canola etc. Watch out for Oatrim, Z-trim and Nu-Trim and any fat substitutes labeled "low fat," "non-fat" or "heart healthy." These foods are hard to digest and can make you sick. Some people mistakenly gave up butter which is high in saturated fat and changed to highly refined hydrogenated vegetable oils like margarine or shortening. When it comes to good fats vs. bad fats it's these highly refined oils that are the worst. These are the true "bad fats." Partial hydrogenation results in trans-fatty acids that elevate cholesterol and are harmful in that they create an immune damaging synthetic fat. Unfortunately, sometimes these margarines are found in health food stores! You need to eat a variety of plant foods and fish to get enough good fats. You will "cover all the bases" if you eat flaxseed meal, avocado, raw nuts and seeds, wild fish and organic, grass fed meats. For oils stick to olive oil, coconut oil and butter for cooking and spreading. For salad dressings you can try some of the more expensive seed and nut oils if they are unrefined but these need to be refrigerated because they go rancid quickly. Good fats are essential for your health and vitality. There are many degenerative diseases that may occur if you do not get enough of the essential fatty acids in good fats. Cardiovascular disease, cancer, diabetes, multiple sclerosis, skin afflictions, dry skin, premenstrual syndrome, behavioral problems, poor wound healing, glandular atrophy, weakened immune functions and sterility are more of these. Eat the right fats in the right amounts and you will be be skinny, healthy and happy. *Greenburger, N.J. and Skillman, T.G. Medium-chain triglycerides:physiologic considerations and clinical implications. N Engl J Med 1969;2801045. Baba, N. Enhanced thermogenesis and diminished deposition of fat in response to overfeeding with a diet containing medium chain triglycerides. Am J of Clin Nutr 1982;35:678. Fife, B., N.D., Coconut Cures. Piccadilly Books, Ltd. 2005. For more articles on how to keep your blood sugar low with your diet read the articles below! Return from Good Fats to Foods That Lower Blood Sugar. Return from Good Fats to Lifetime Fat Loss home page.